We live in a sea of subtle energies. When we become conscious of them, we can learn to use them. 7.83 HZ: Earth and the cosmos exchange energy and information. In a previous article, Your Cells Are Listening: How Talking To Your Body Can Help You Heal, I wrote about a surprising ability that was awakened within me after several months of dedicated meditation. This is the ability to converse with my body through words, and receive dramatic physical responses. As I talked with my leg – where I was experiencing severe pain and partial paralysis caused by a condition called reflex sympathetic dystrophy – I suddenly felt scar tissue unwinding under my skin, nerves firing and energy moving along defined pathways through my calf. My calf muscles began to perform flexion and extension exercises independently of my conscious control, as electric-like jolts continued to shoot through the area. Through a series of conversations with my leg, I was able to completely restore function to the muscles. Realizing the broad potential of this mind-body technique, I organized my approach into a system that I could teach to clients, called Antara (Sanskrit for within). D. Wilcock, The Source Field Investigations: The Hidden Science and Lost Civilizations Behind the 2012 Prophecies. Penguin Group, 2011, ISBN 978-0-525-95204-6. D. Holzman, What’s in a Color? The Unique Human Health Effects of Blue Light. Environ Health Perspect, Jan. 2010; 118(1): A22–A27. PubMed PMCID: PMC2831986. S. Balaguru, R. Uppal, R. Pal Vaid and B.P. Kumar, Investigation of the spinal cord as a natural receptor antenna for incident electromagnetic waves and possible impact on the central nervous system. Electromagnetic Biology and Medicine, Volume 31, Issue Feb. 2012, pp. 101-111. doi: 10.3109/15368378.2011.624653 . Full Text. M. Blank and R. Goodman, Dna is a fractal antenna in electromagnetic fields. Int J Radiat Biol, April 2011; 87(4):409-15. doi: 10.3109/09553002.2011.538130. Epub Feb. 28 2011. PubMed PMID: 21457072. G. Squier, Talking Through The Trees. Electrical Experimenter, July 1919, p. 204. K. Ikrath, W. Kennebeck, and R. Hoverter, Performance of Trees as Radio Antennas in Tropical Jungle Forests, (Panama Canal Zone Experiments), United States Army Electronics Command, Fort Monmouth, N.J., Research and Development Technical Report, Feb. 1972. Tesla: Life and Legacy – Colorado Springs. PBS. Retrieved February 29, 2016. N. Tesla, “The Transmission of Electric Energy Without Wires”. Electrical World and Engineer March 5, 1904, 43: 23760–23761. T. Valone, Harnessing the Wheelwork of Nature. Adventures Unlimited Press, 2002, pp. 9-11. ISBN 1-931882-04-5. K. Orrman-Rossiter, Ahead of his time: the genius of Nikola Tesla. Australian Science, Jan. 30, 2013. Retrieved Feb. 24, 2016. Tesla: Life and Legacy – Who Invented Radio? PBS.org. Retrieved Feb. 29, 2016. To Mars with Tesla. Teslasociety.com. Retrieved Feb. 25, 2016. B. Gingras, G. Pohler, and W. Tecumseh Fitch, Exploring shamanic journeying: repetitive drumming with shamanic instructions induces specific subjective experiences but no larger cortisol decrease than instrumental meditation music. PloS One, 2014; 9(7): e102103. Published online Jul. 7, 2014. doi: 10.1371/journal.pone.0102103. PMCID: PMC4085008. J. Lagopoulos, X. Rasmussen, A. Vik, G. Malhi, C. Eliassen, I. Arntsen, J. Saether, S. Hollup, A. Holen, S. Davanger, O. Ellingsen. 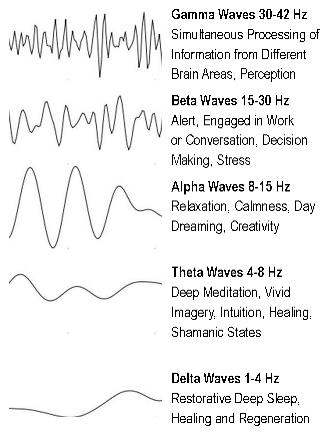 Increased theta and alpha EEG activity during nondirective meditation. J Altern Complement Med. Nov. 2009;15(11):1187-92. doi: 10.1089/acm.2009.0113. Nikola Tesla at 75, Time Magazine, July 20, 1931, Vol. XVIII, No. 3. J. O’Neill, Prodigal Genius: The Life of Nikola Tesla. Cosimo, Inc. 1944, p. 264, ISBN: 1-59605-713-0. Therese Wade received her Master of Science Degree in Acupuncture and Oriental Medicine from Bastyr University in 2003. Her combined experience with Chinese medicine, shamanic studies, kundalini meditation and hypnotherapy are integrated within her approach to mind–body–spirit medicine. Please visit www.antarahealingarts.com for more information. Next Could you live without cash?